Watching the TV is a popular activity in our house - with myself and Mr Huge films fan it was always going to be the case, and whilst it's not the only activity, it does feature a lot. So when I came across a children's show I hadn't watched I was surprised, as I've seen a lot. The children don't miss a thing though, and when we were sent the new Go Jetters toy to try out they already knew the characters names. Apparently Go Jetters is actually a year old, however with the release of the latest series they have brought out a range of toys inspired by the geography-based series. We were sent the Head Quarters Jet Pad and Ubercorn Plush to try out, and the children were excited to give them a try. The Jet Pad is quite an interactive toy, featuring a projector at the front which lights up and shows landmarks from around the world. 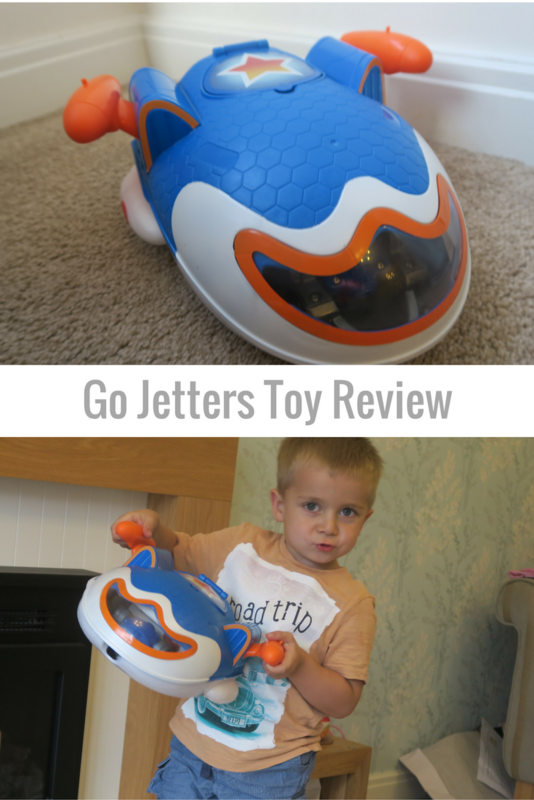 When the jet pad is closed it then flips out to the front the light the way for the the Go Jetters. There is also a hidden compartment where the children can store an extra bits, and a button which plays various songs and lines from the show, which is always welcomed by the children and not so much the parents, however there is an auto shut-off to save your eyes and ears! The Jet Pad comes with one figure - Kyan - and a jetpack and extendable arm that can be fit on him and then taken off as desired. As with most playsets, it only has the one toy which makes play a bit less fun, so you really need to buy extra figures to make it a bit more interesting. Another character that features in the show is Ubercorn, who is a disco-loving unicorn and the leader and mentor of the Go Jetters. We were sent a plush version of Ubercorn to try, who also sings and says phrases when you press his tummy and if you press his foot you can hear the Go Jetters theme tune. My two really took to him, in fact he's ended up sleeping with Holly a few nights - he's a great size and features the glittery, sparkly outfit he is known for from the show. We've had a lot of play out of the Jet Pad in particular and for fans of the show I would say it is a must-have. It retails at £39.99, so is comparable to most other playsets, with additional figures ranging from £12 to £16. Whilst this is on the pricey end for a figure, it should be noted that they come with add-on pieces. Ubercorn retails at £19.99, which is a reasonable price for a good size toy with interactive features. *We were sent these toys FOC however all opinions are my own.